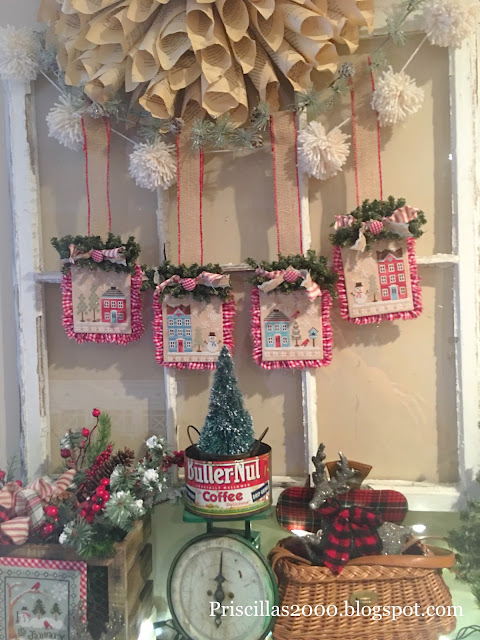 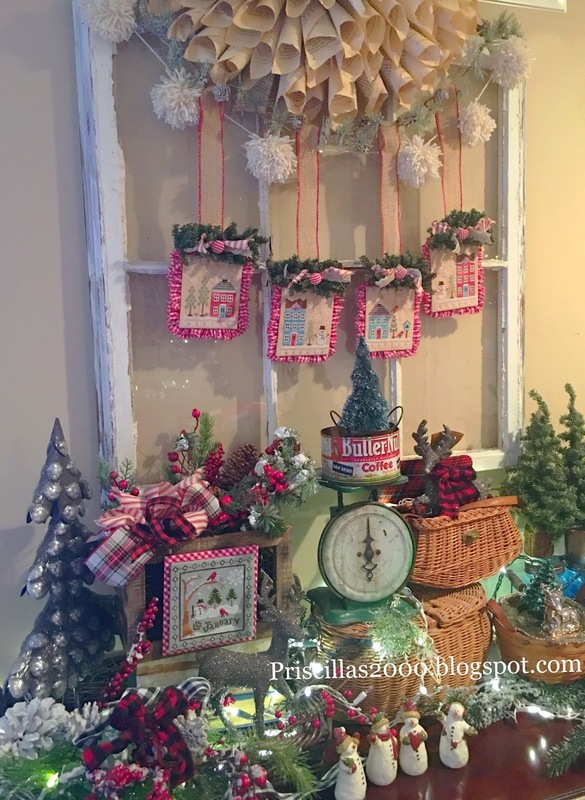 added a big sprig of frosty greenery and a burlap bow ...how cute is it now!?! 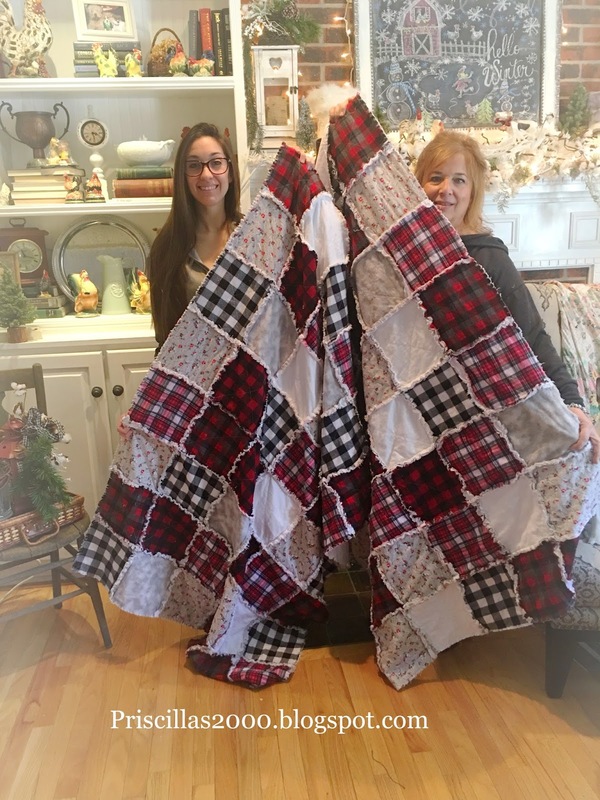 So Saturday was a day in the sweat shop kitchen for my daughter Chelsea and I .. we made flannel rag quilts! So fast and easy .. we made 2 of them in an afternoon ...from cutting to sewing and cutting the seams! 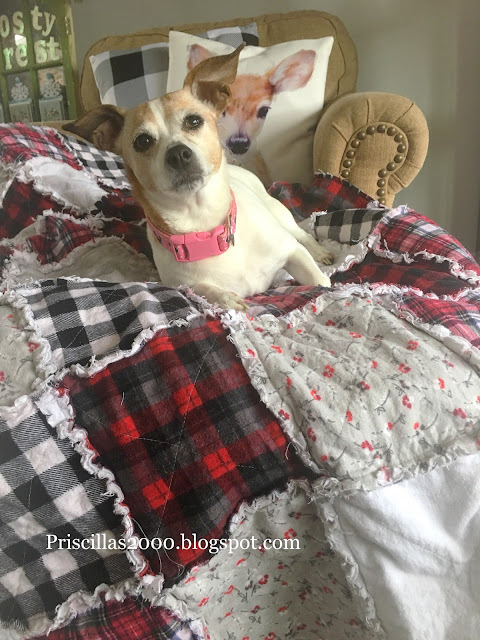 Last week I went into Joann Fabrics and they had their flannel for $2.99 a yard and then an extra 20% off ..I had watched a couple You Tube videos on these and thought we would be able to make them very easily.. 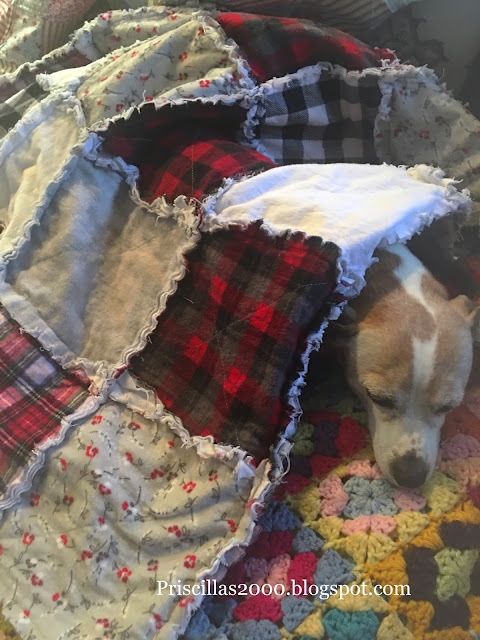 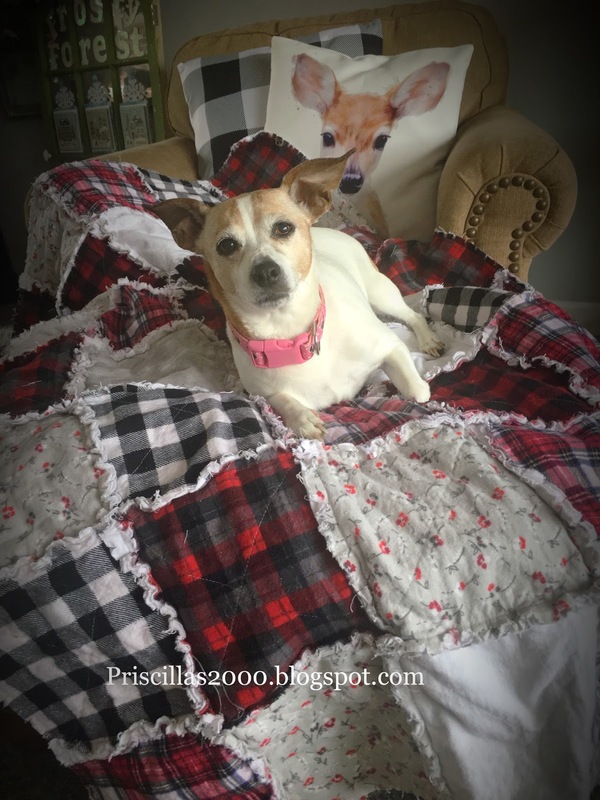 I chose for us to do a wintery looking blankets with the plaids and buffalo checks... the only thing I think I did wrong was not buy enough fabric to make them bigger. 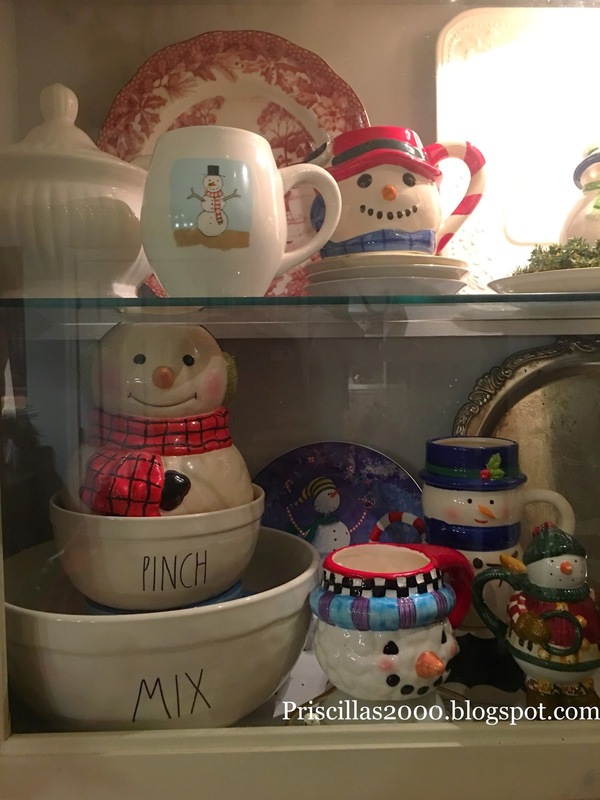 We can always add to them .. 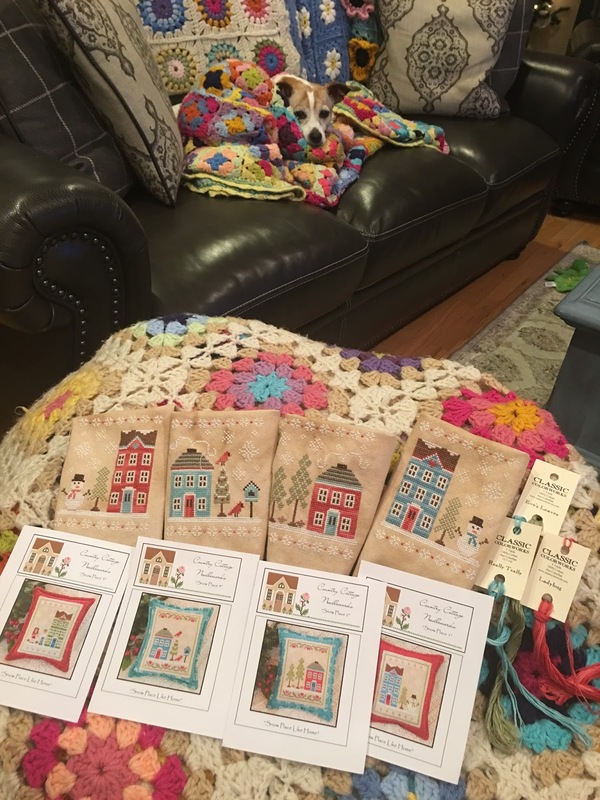 But we did 9 inch squares and did 6 across and 8 down . Probably 7 across 9 down would be better.. 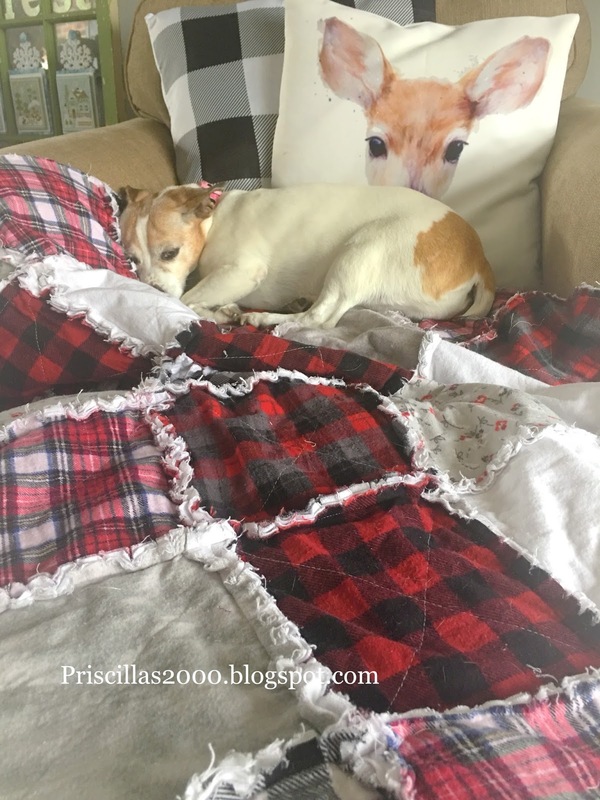 But I do like my blankets big! There is still a lot of excess threads coming off the seams so excuse that .. I am going to wash it again today .. washing is how you get all the seams to "ruffle" there is no binding or batting only 2 layers of flannel. 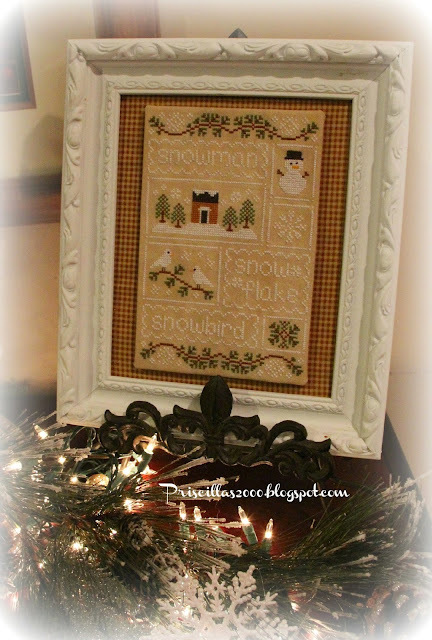 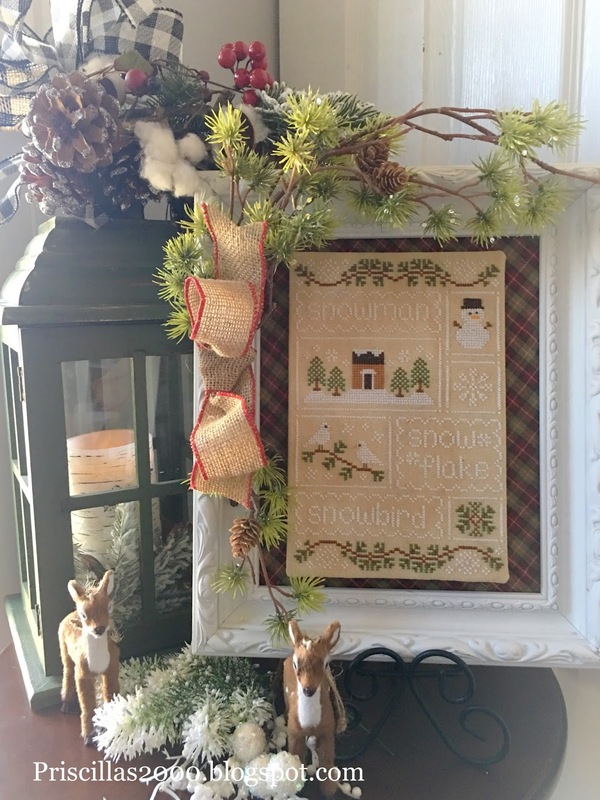 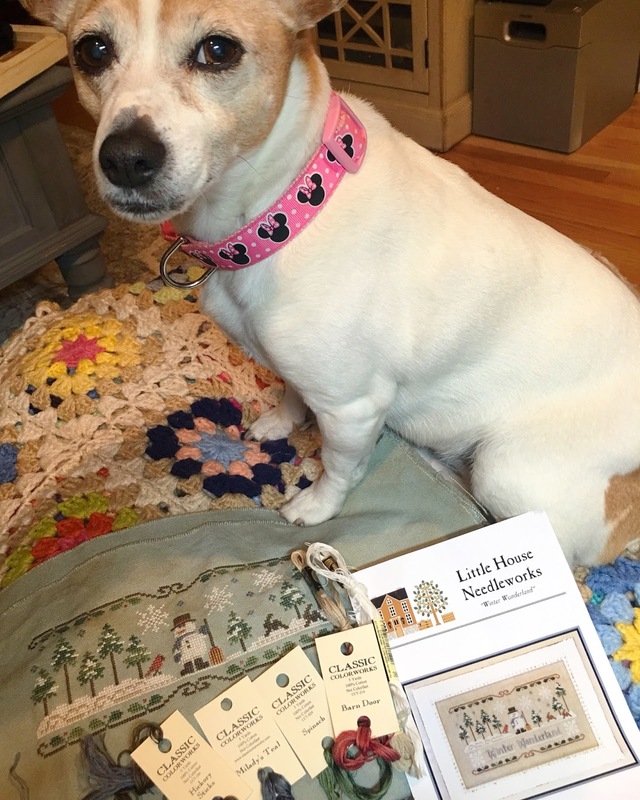 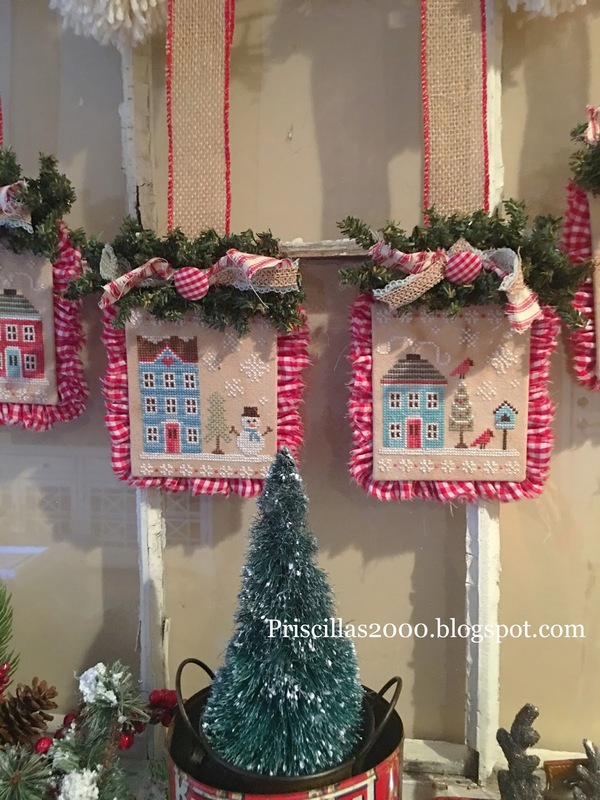 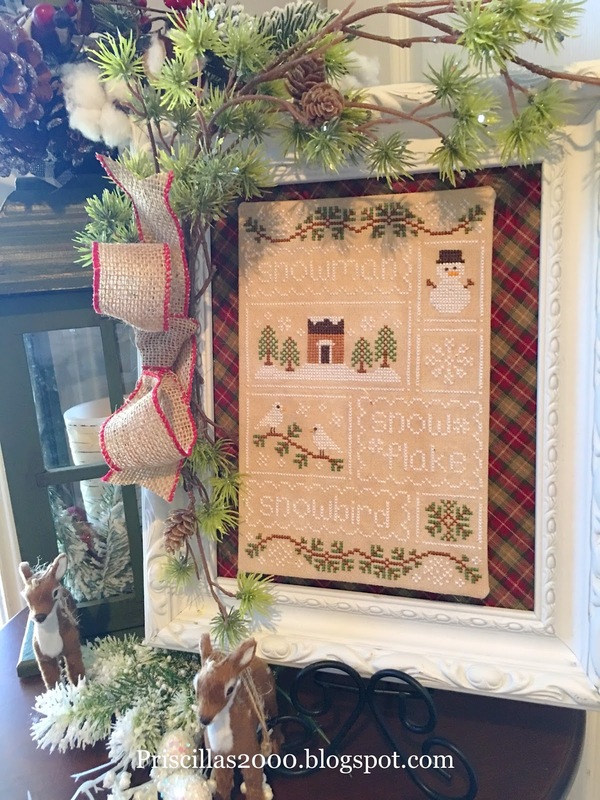 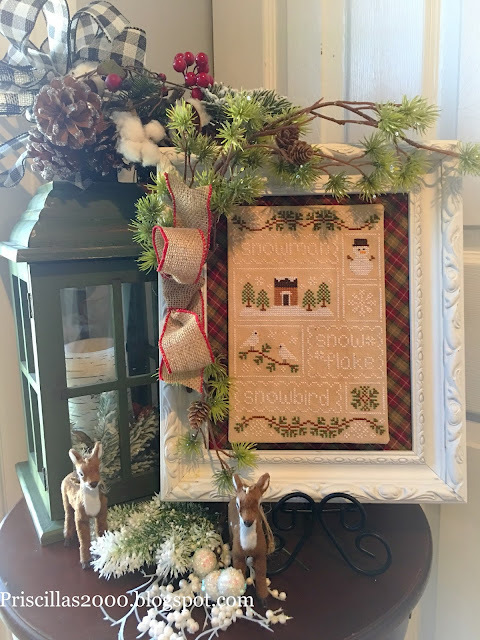 I finished stitching Winter Wonderland from Little House Needleworks a few days ago .. 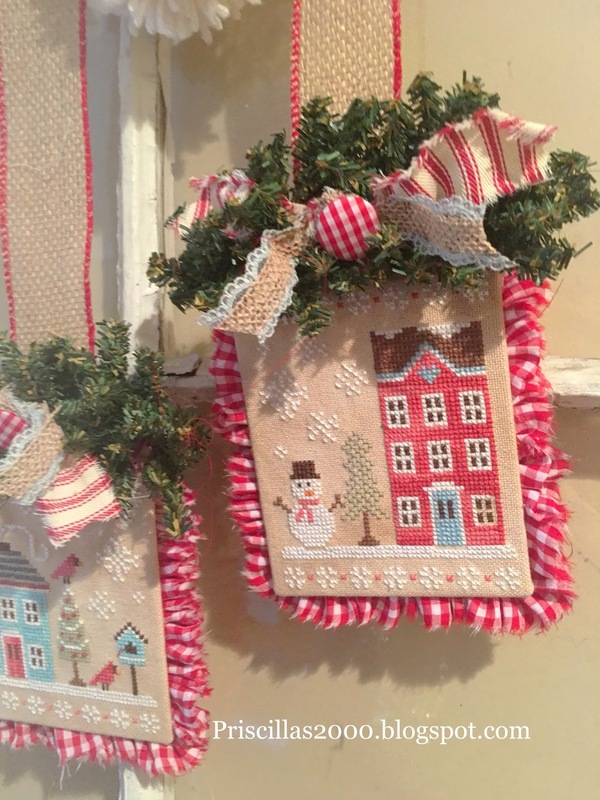 These pieces look so cute together with their red gingham and blue colors.. 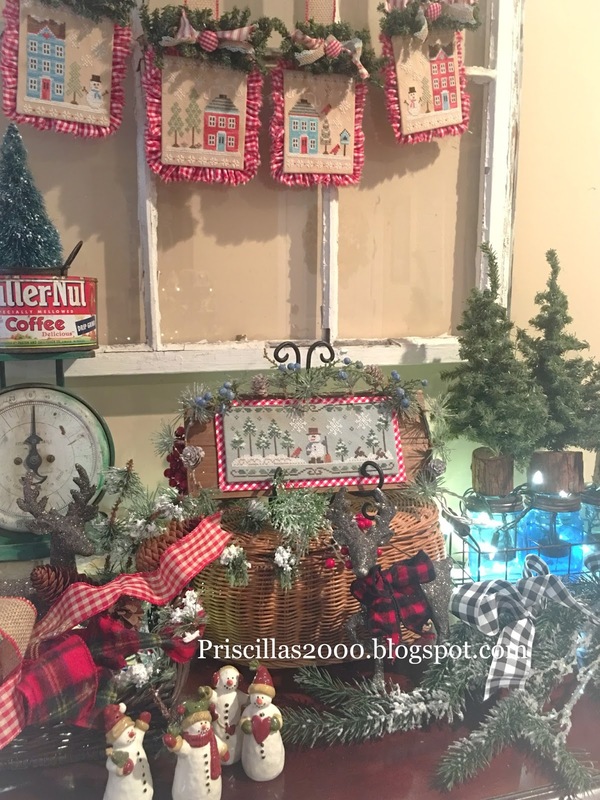 I mounted it on sticky board .. added another sticky board covered in red gingham to the back ... Not sure where this wood planked board came from but it was the perfect fit for the piece.. I used the same garland that I used on the Snow Place like Home Banner.. 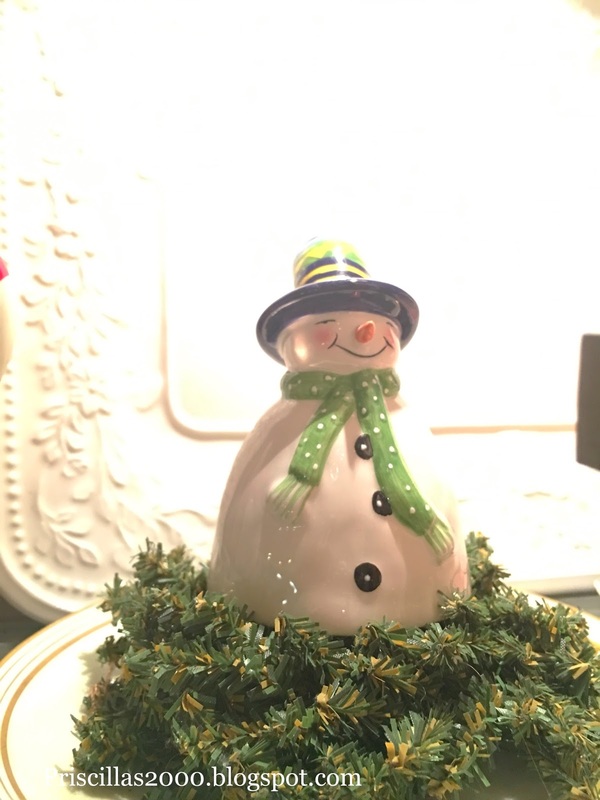 I then added some greenery to the top that had blue berries .. Thanks for stopping by! 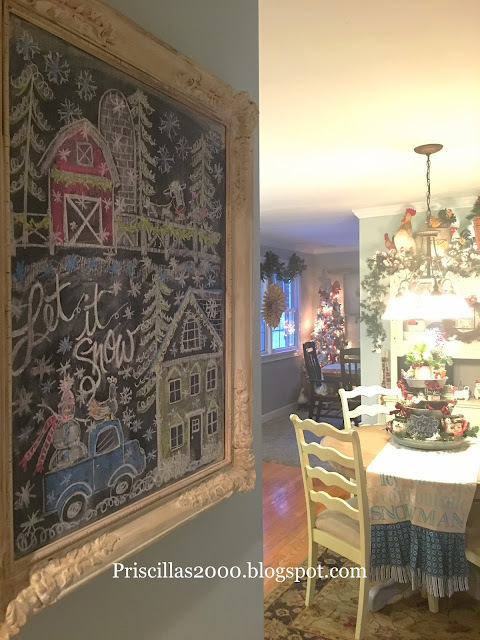 The seasonal chalkboard in the kitchen finally got erased and redrawn last night ! I had a hard time erasing the Christmas Holly Jolly Farm :) I think it was one of my all time favorites! 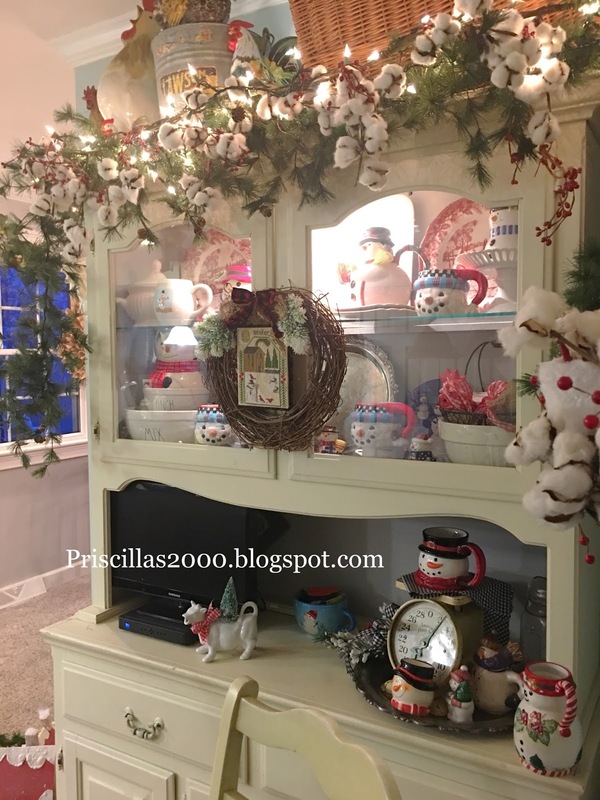 gosh I loved that one! 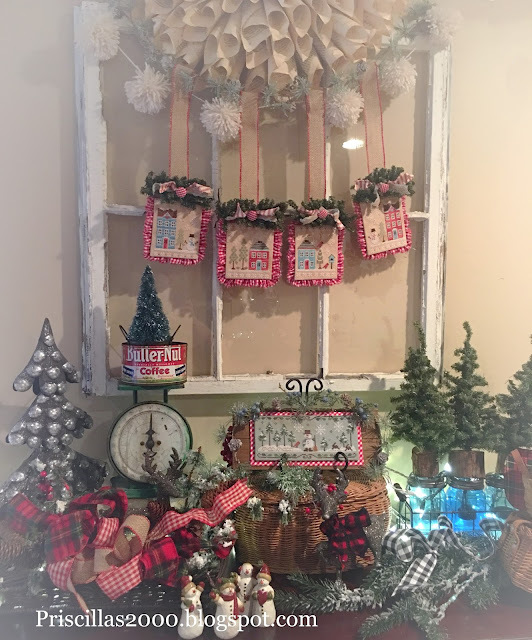 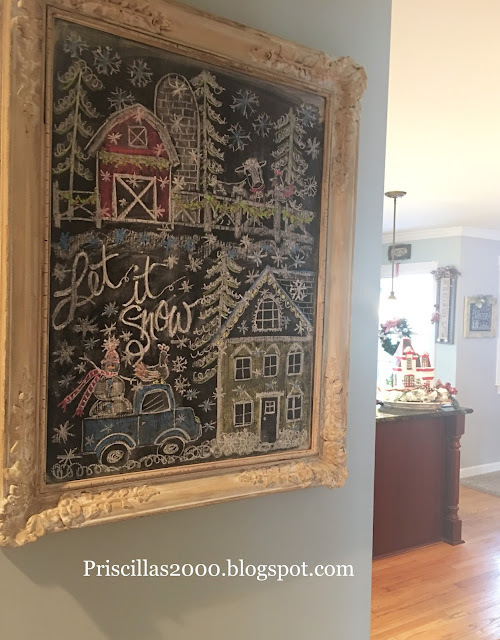 Yes I still have 3 trees up ..the snowman tree in the family room .. the ice skate tree in the dining room and a small tree just filled with cotton branches in the foyer..
Love all the farmhouse decor so the chalkboard has a winter farm theme .. look at that cute cow! 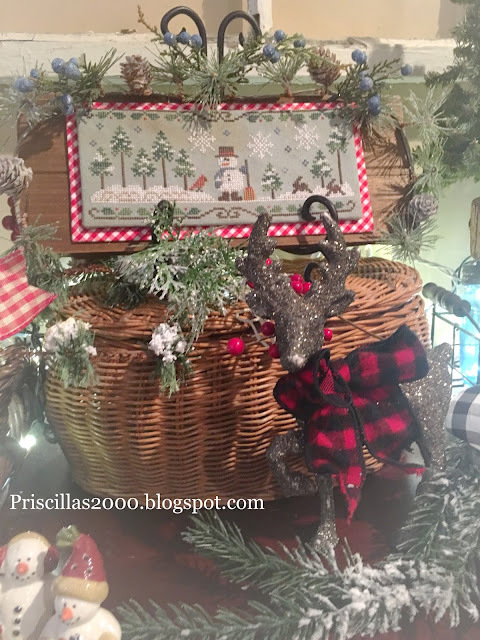 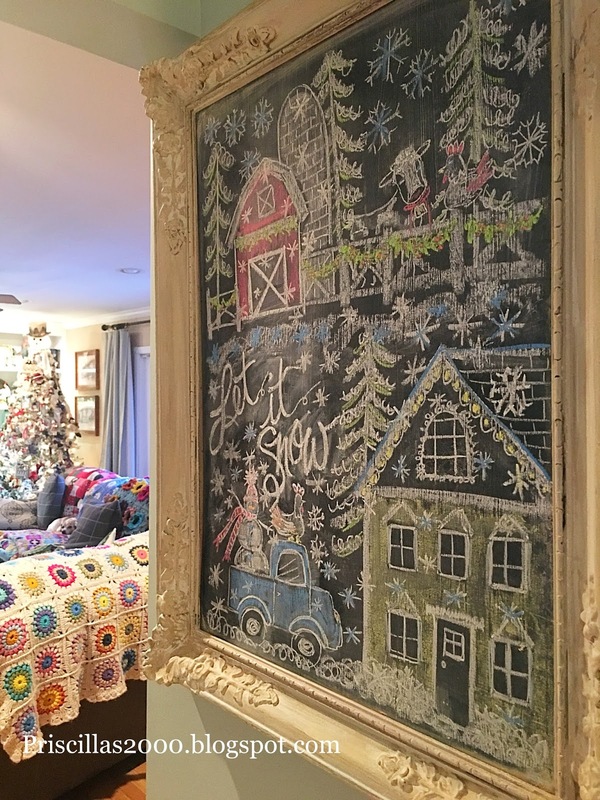 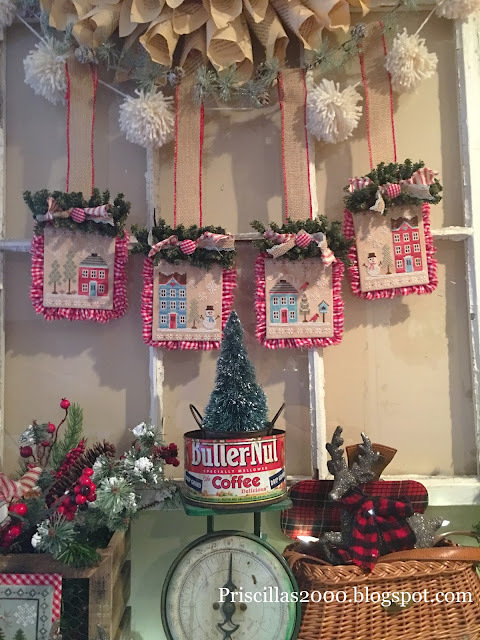 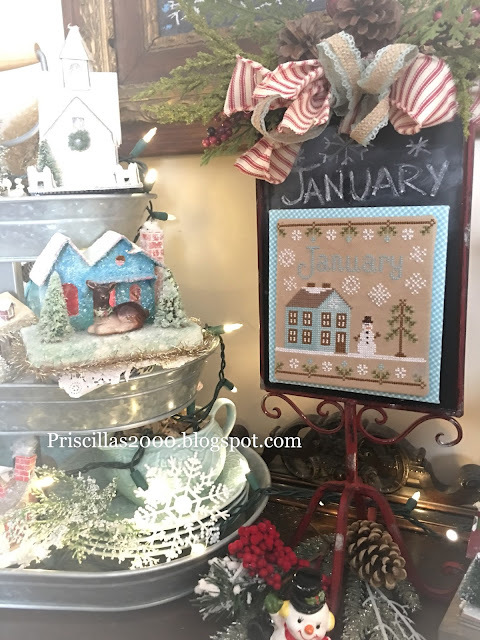 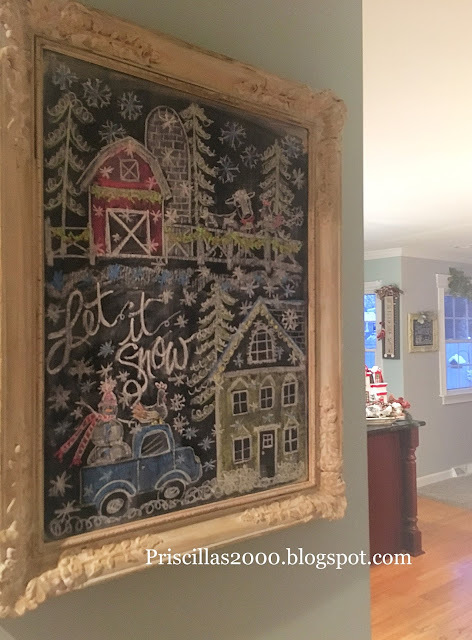 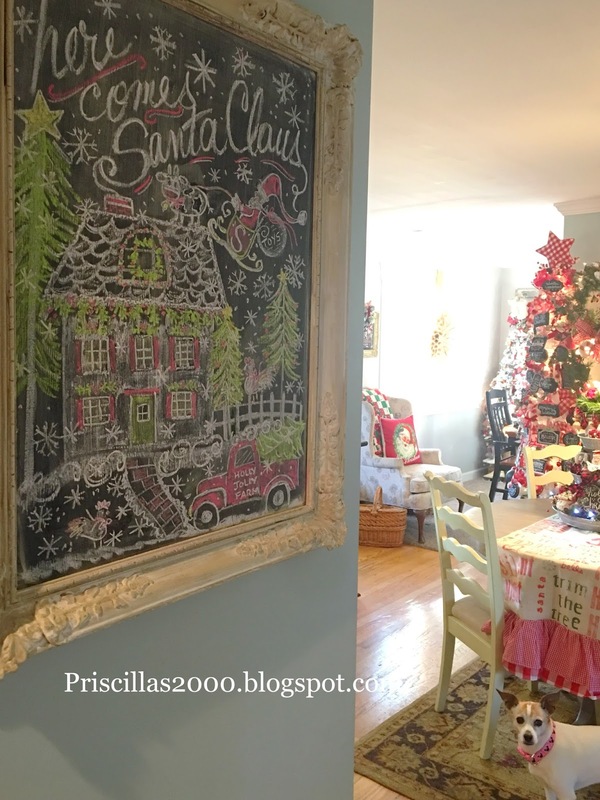 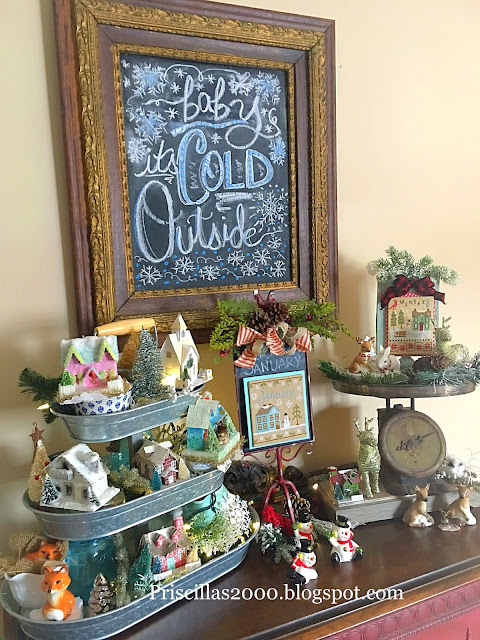 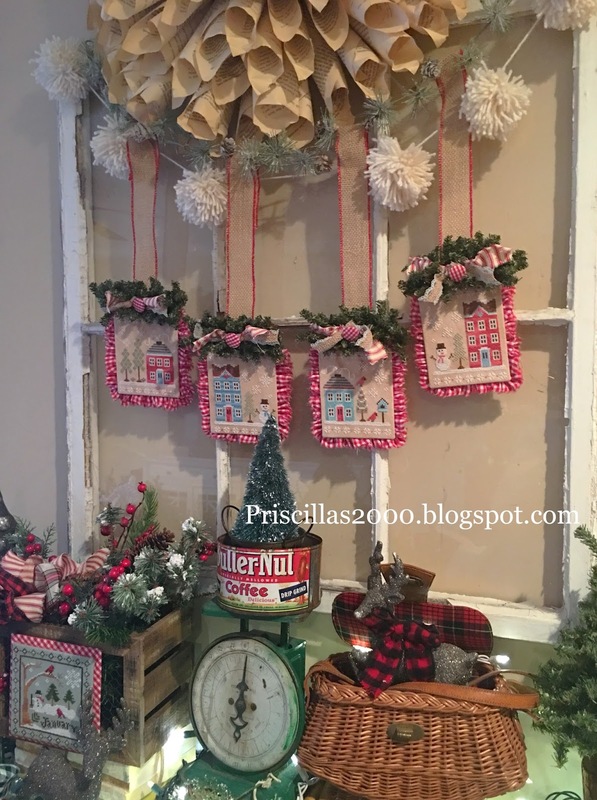 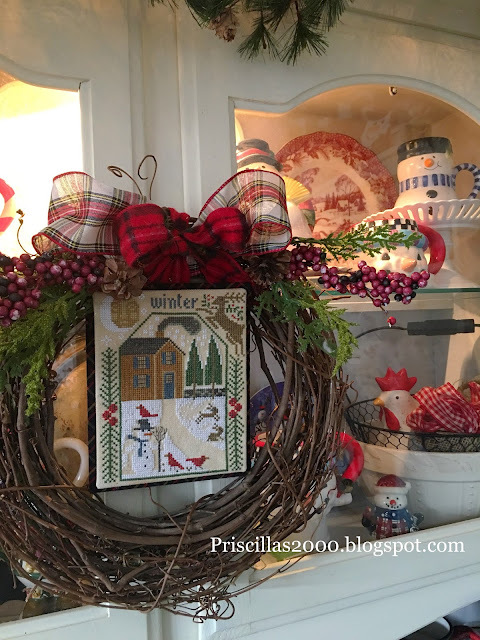 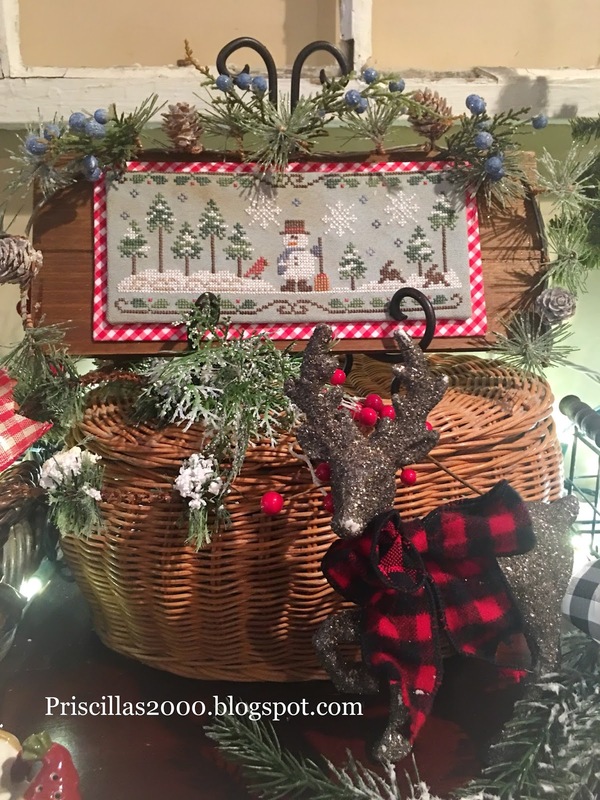 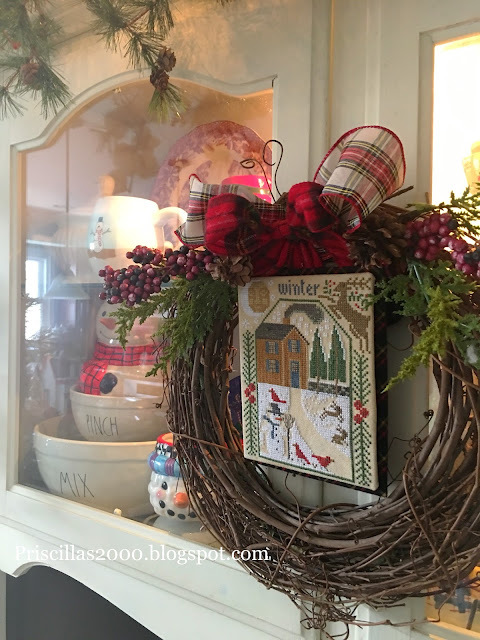 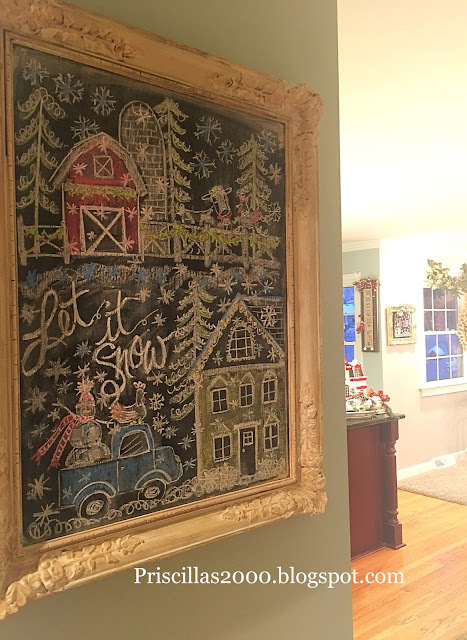 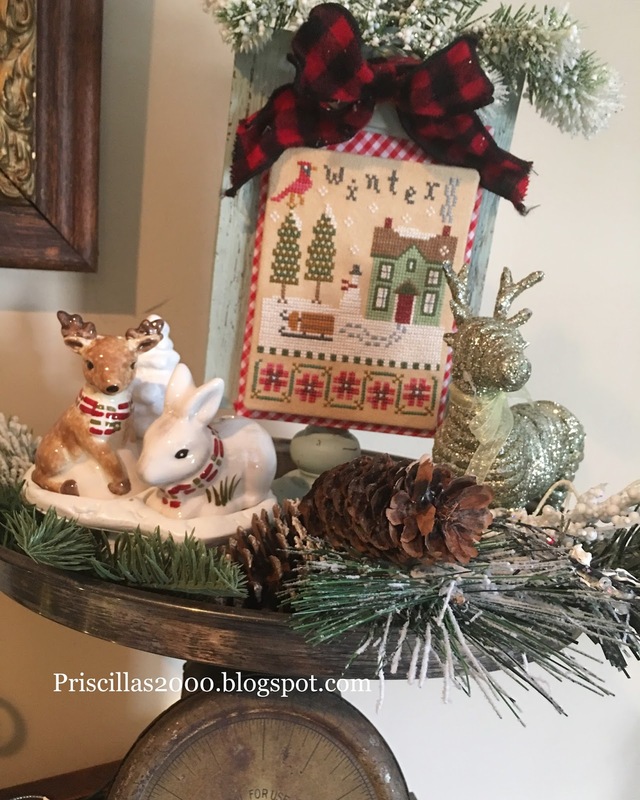 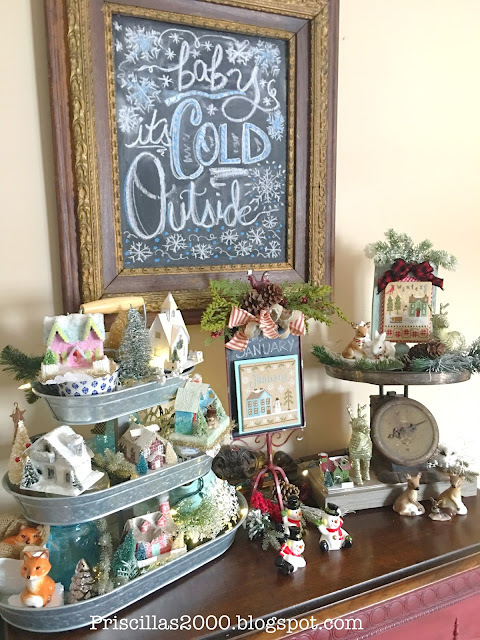 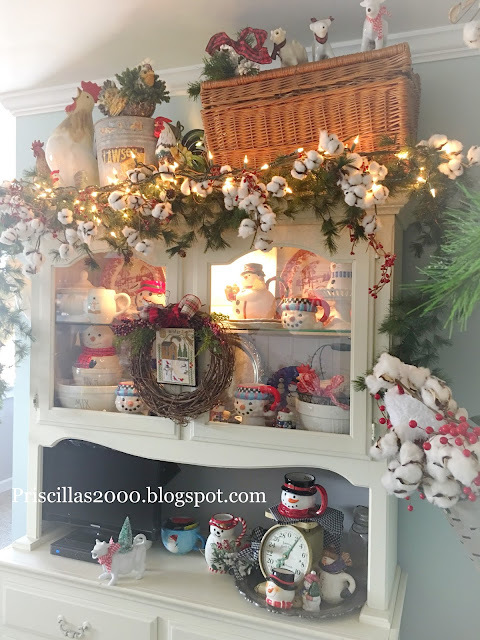 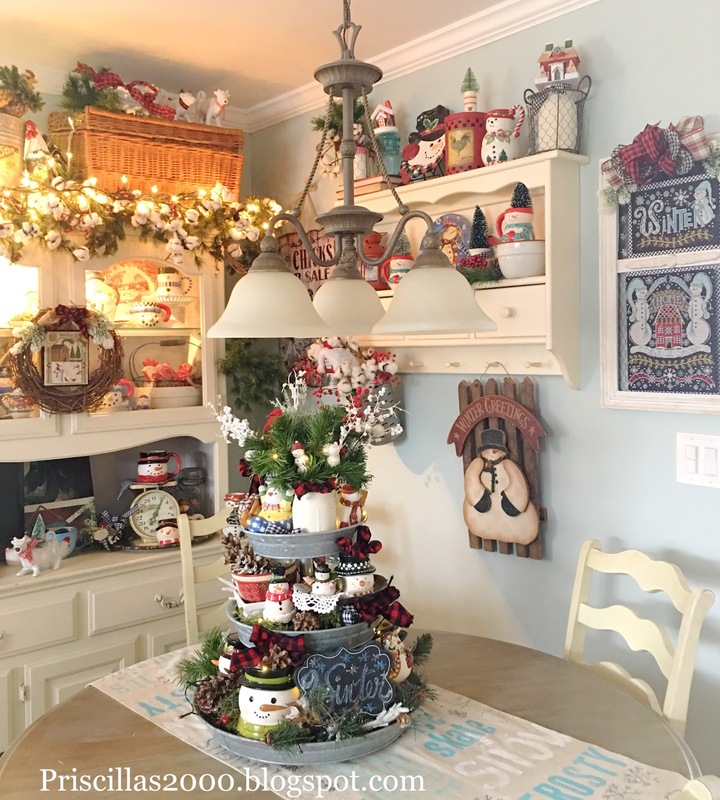 I wanted to show you one of my winter vignettes in the family room today since I finally erased the Christmas chalkboard and added a winter saying to it! 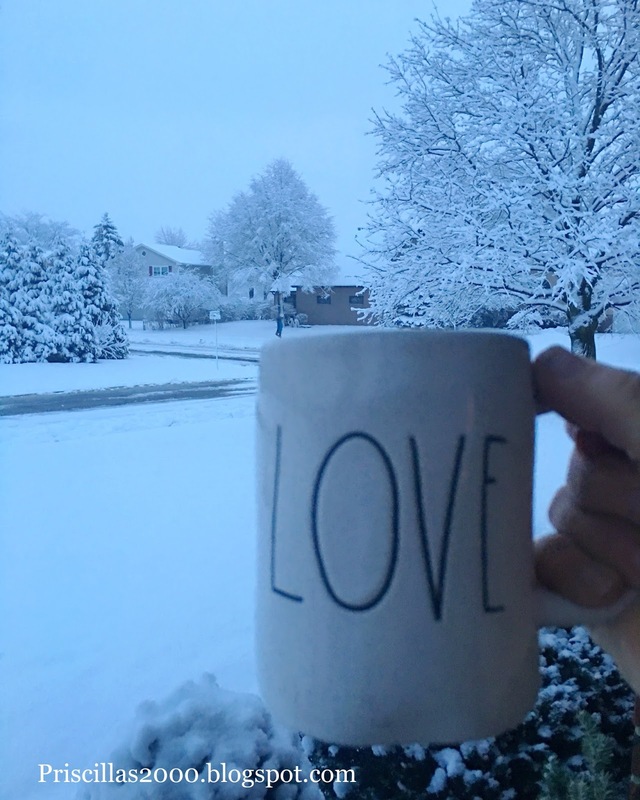 Yesterday it was 54 degrees here.. this is what I woke up to..Isn't it beautiful? 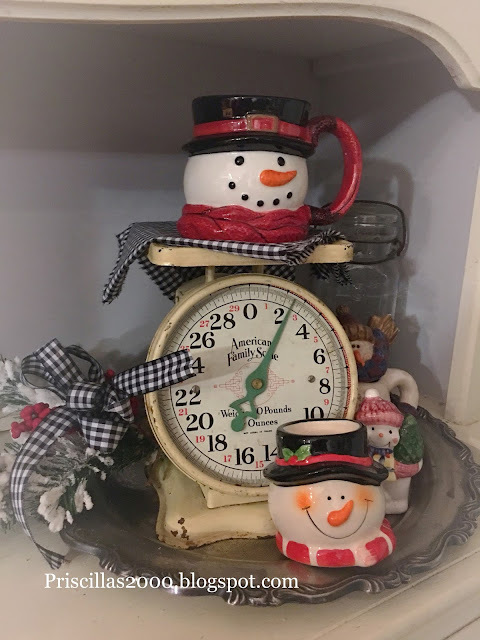 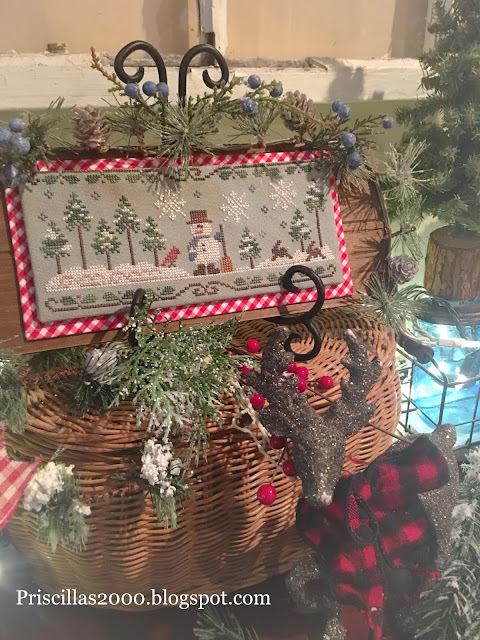 This Lizzie Kate 4 seasons Winter sits in a thrift store tray on top of a vintage scale..Lots of winter still scattered all around the house! 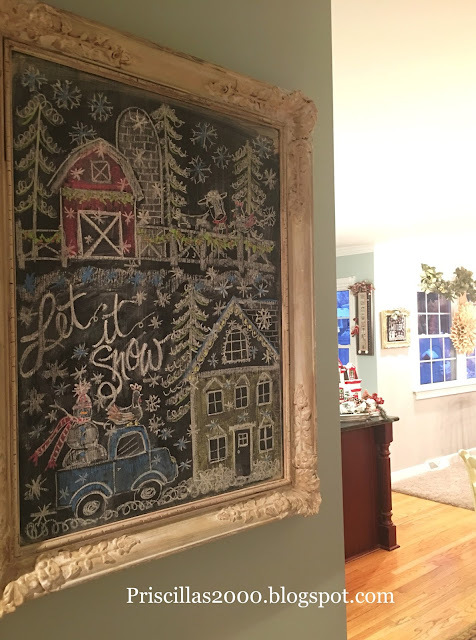 I found this chalkboard frame at Hobby Lobby .. There is a chicken on the top you might not be able to see because of the greenery ... 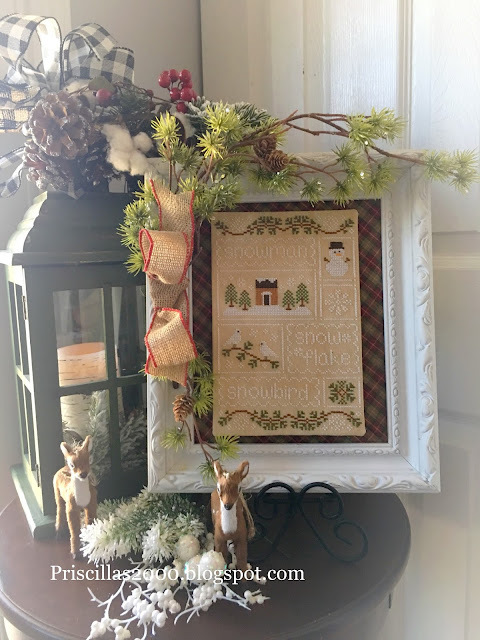 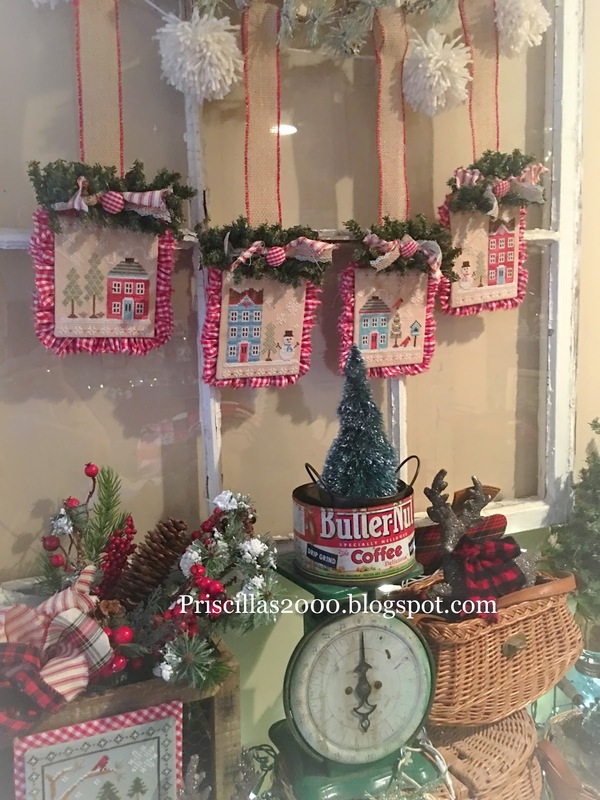 I stitched all the Country Cottage Needleworks Cottages of the month a few years ago and decided they needed a little redo .. I added the aqua gingham on to the back and added magnets to attach..I am going to leave the outside of the frame red for a couple months but then I will paint it off white so it goes with every month..I also added a bow to the top that will get changed out for each month.. 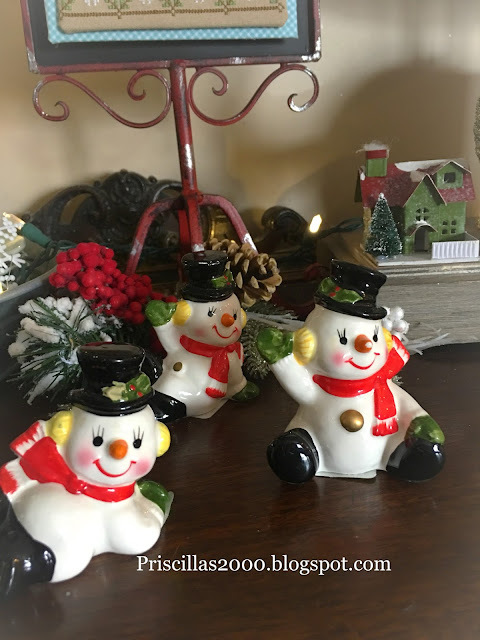 I found these little Fitz and Floyd snowmen at the Good will this year .. they are so cute! 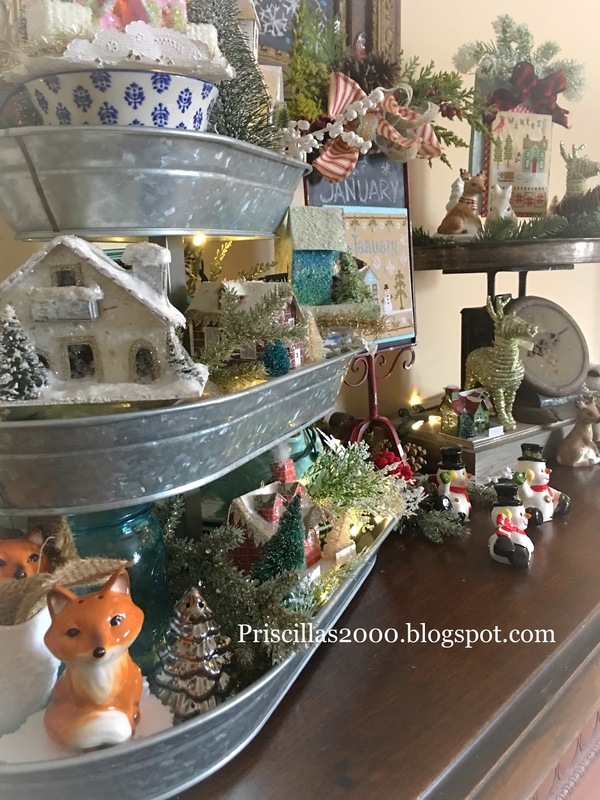 The oval galvanized tiered tray is full of vintage and new Putz type houses..
and yes it is Cold Outside ! 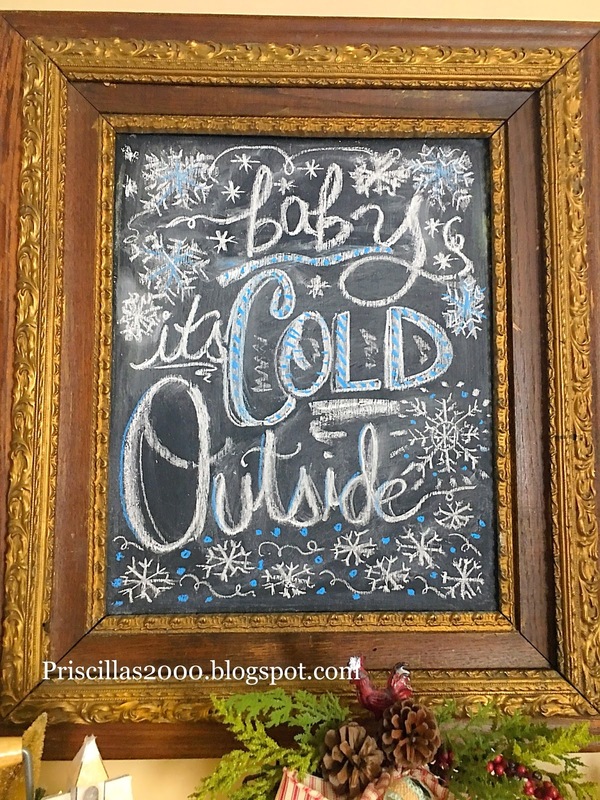 So that is it.. I need to go shovel ..hope you have a great day!